That is soooooo cool . . . err hot . . . err, you know what I mean. I have always wanted to try glass blowing, I have always been in awe of how this heated liquid can be molded and formed like that and make such amazing things. 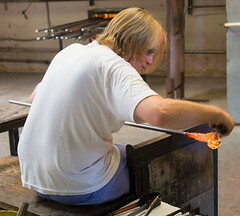 At the Texas Ren Fair there was a glass blowers stall and I used to just sit and watch for hours on end. Needless to say I am envious and really stoked for you at the same time. Keep us all informed on this awesomeness, well me at least.